I swear this isn't me. Slashfood's Kristyn Pomranz shared this photo from a booksigning in Syosset, New York for Yum-O: The Family Cookbook. Even I wouldn't go this far! 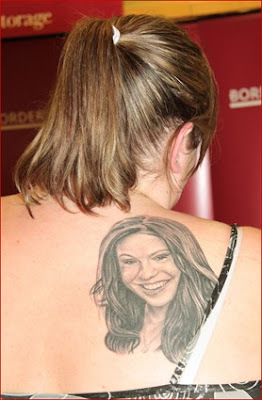 Anyone that reads this blog want to fess up and take ownership of this tattoo? Any chance it was just temporary? I was at that booksigning and I saw that woman and it looked VERY real to me!!! She also drove a car with the license plate "RR YUM O" -- no joke!!!!! Wow. that's like stalker territory. Wow, that's certainly some serious worship. Wow! Ok, that seems a little extreme to me. Good tattoo as far as likeness to RR. Wonder what Rachael thought about it. I think I'd be kinda creeped out by it. YES people it is a real tattoo. I am the owner of that tat. Insted of slashing me with comments and thoughts how bout you hear why the tattoo was done? I understand people are titled to opinions which anybodys opinions dont bother me but anyway, I lost over 130lbs as of last year because of Rachael Ray. I made a bet with my cousin if I lost the weight I'd get a tattoo. So I did and Its the only tattoo I ever gotten so I wanted it to be memorable. As I got it done anytime I swore or said ouch me and my cousin thought it be cool to donate money to the YUMO organization and it was over 4000.00 so far. Rachael loved the tattoo infact so did her husband John. As I was leaving the bookstore in Syosset he invited me to come to his gig for his band in NYC so I got to party with the band and Rachael and her buddies. The Tattoo is meaningful, I known Rachael for 6 years almost 7 and because of her I wouldnt be where I am at today. So with that in mind I'd like to leave you all with a thought, Can you tell me one person famous that would take the time out of their day to talk to you, encourage you, and make you fell like a star yourself? I think NOT. Rachael is an amazing person on top of being busy and she gave me the time of day, she cares and to that yes, it is dedication, yes people that dont know the story may think its weird of creepy but all that matters is I like it, my family, friends, Rachael, her husband and everyone else Ive talked to.Yes feel free to express yourself but I assure you its for a good cause and it has meaning. Hi This is for the lady with the tattoo - Please could you contact me. My name is Jeff Rayner and I am a photographer. Would love to know more about the tattoo - I think it is amazing.